At least 16,400 Texans who voted in the November election wouldn’t have been able to cast ballots if the state’s voter identification law had been in full effect, state voting records show. Through a public records request to the Texas secretary of state’s office, the American-Statesman obtained copies of the more than 16,400 Reasonable Impediment Declarations signed by Texans in the November election. More than 2,300 of the forms, legal affidavits punishable with a perjury charge if found to be false, were signed by Travis County voters. The voters who signed the affidavits were concentrated in urban areas, with six counties alone — Harris, Travis, Dallas, Collin, Tarrant and Hidalgo — accounting for more than half of them. 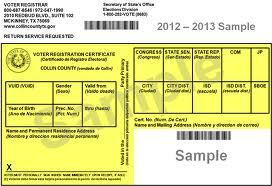 Those voters arrived to the polls without one of the seven forms of ID, but were able to vote after signing the form and providing a voter registration certificate, birth certificate, utility bill, bank statement, government check or any other government document that included the registered voter’s name and address. To sign the forms, all of those voters would’ve had to have been registered to vote and to produce documentation proving who they were. Former Texas Secretary of State Carlos Cascos, an appointee of Gov. Greg Abbott who stepped down after overseeing the November election, said the potential of 16,400 voters being turned away was less worrisome in light of the fact that about 9 million Texans voted. “When you put it in perspective, to me it’s not a large number,” said Cascos, a Republican. Cascos is right – sixteen thousand out of nine million isn’t that much. He’s also right that every single one of them would have been disenfranchised had they been turned away, and for no valid purpose. That sixteen thousand just represents the people who tried to vote. We don’t know how many others didn’t bother to show up because they didn’t know that they could have voted – it’s not like the state’s “outreach” was terribly effective. And those sixteen thousand voters who would have been disenfranchised, plus those however many who actually were in this one election, are way way way more than the total number who have ever been credibly accused of any form of vote fraud. As long as we’re putting things in perspective, let’s keep that in mind as well. I’m really surprised the number was that high. I’d be interested to see those numbers further investigated. How many of those had recently lost their wallets, and thus, had an ID issued, but didn’t have it with them? I’d also be interested to see someone investigate those votes for possible fraud. I just can’t believe that 16,000 people have never had a DL or ID card before. That would pretty much disenfranchise those people from modern life. They can’t get a job, they can’t open a checking account, they can’t buy booze and cigarettes, they can’t rent an apartment or buy a house, etc. I would really like to see some human interest stories about these 16,000 people. If they truly do not have an ID, they must be living some kind of Third World existence, right here in the US. I’d also be interested to see someone investigate all those people who are constantly seeing bogeymen and votes for possible fraud. Why don’t you call the offices of the Governor, Lt Governor, Attorney General and Sec of State and see what response you get about their desire to actually do ANY factual investigation. Please report back about the crickets you hear. There are all kinds of reasons Bill besides the one that the fake news you might hear or see claim, but to be on the safe side, I listed a station affiliated with Fox, so you might give it more weight. It is not always about not having an ID? Read your story. That woman wasn’t disenfranchised because she failed to show a DL or a Texas ID card at the polls, she was disenfranchised because DPS made a clerical error. The state’s ID law had nothing whatsoever to do with her situation. Yes it did, she is considered not having a proper ID, Bill. Her provisional ballot was denied. She was denied the right to vote. Some people could be waiting for the license, some could have had the wallet stolen or maybe they misplaced it. Maybe they left it when they had to pull it out for ???? I don’t even recall the last time I had to show my ID to anyone. With the chips on the credit cards they don’t ask for IDS. I use debit to pay and not checks. Few times I use checks is to mail a few payments. They don’t require and ID. Has been over 20 years since I have had a traffic ticket so no reason to pull out my ID. My banking is done online? I know when I had something notarized a few years ago, but that was because of a volunteer position that I have. Bill you make it sound that we have to show our IDs all the time, we don’t. My uncle a Korean veteran who is 84 has an old expired driver’s license, but has no problem in regards to his social security checks and medicare. But those small towns, they all seem to know each other. Oh yes, when I first got my passport about 20 years ago, I had to show my TDL. Assuming she was denied from the November, 2016 voting, that means she would have had a DL for almost a year, even if we say it took a whole month for DPS to mail it to her. They couldn’t verify her eligibility because when she showed up to vote, with the DL she got almost a year earlier, she was not listed on the voter registration rolls, thus the provisional ballot. The DPS screwed up by not forwarding her voter registration to the county, but that has absolutely nothing to do with the new voter ID law. The article tells you she’s got a Texas D.L., so lack of ID wasn’t the issue here. Not being on the voter rolls was the issue. Off the Kuff should be proud that professional troll soldier (paid?) Bill Daniels is spending the time and effort to cast doubts and misinformation as an extension of the conservative entertainment outrage complex. Bill, that is part of the ID law, but you are at least starting to comprehend that it is not just about not having an ID. In my case, while I did not have to vote a provisional ballot, I had to sign an affidavit, because my driver’s license did not have matching suffix with how I was registered to vote. It was easier to change my voter registration than my TDL. But you are learning Bill, and who knows one day your eyes may be wide open. I didn’t expect the Fox article about the registration problem of Chantel Wooley to generate this much discussion. In re-reading the article, her situation is clearly a registration issue, not an ID issue. She presented to vote in the May 2016 Katy ISD election, was told she was not registered by the polling place workers, requested to vote provisional in the belief that she was registered, and did so. Upon examination of her provisional affidavit by staff at the Voter Registrar’s office the determination was made that she was not registered and so her ballot was not counted. Nowhere in this storyline is there any mention that she either did or did not present valid ID. I’m assuming she did since at the time (May 2016) the full ID requirements were in effect. The question raised in the article is, why was she not registered when she thought she was, even to the point of possessing the DPS receipt saying she had registered. From the content of the article, all one can conclude is what Mr. Harris concluded: somewhere in the process her application fell through the cracks. Nobody is saying that is acceptable. I will repeat his advice: whatever method you use to register to vote, or update your existing voter account in Texas, if you have not received by US Postal Service delivery a new voter certificate at the end of 30 days then you have a registration problem and you should call your local registrar of voters that day to find out what it is. All this having been said, Texas’ ID law is clearly onerous and designed to impose hardship on those who have various issues in their lives that make compliance difficult or impossible. However, it doesn’t help to conflate ID procurement issues with registration issues, especially since, thankfully, Texas does not yet require presentation of valid ID at the time of registration. Voter I guess one is suppose to know that they will get something, voter certificate. The receipt from DPS is not sufficient. Whether ID or in this case registration (Although that is not really the case as she did everything properly), it goes back to, the Republicans have the system rigged. Someone who was entitled to vote was denied that right. According to the story, DPS they sent the correct information the day after the inquiry. Someone passing the buck, and all the bucks stop with the Republicans. Neither, I would bet this exact same scenario will happen more than once under the new VR Bennett. It’s a given that large systems don’t function at 100%. You’re correct that most applicants are unaware that not receiving their certificate in the mail is a red flag. I hope VR Bennett’s outreach efforts will address that problem.